In 2016 “Triomphe de l’Art”, asbl starts the International Master Courses for advanced musicians with a professional level. The participants will give a recital at the end of the master courses and they will receive a certificate. 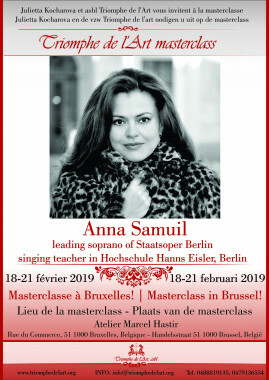 The concept of a master course is based on the opportunity for talented young artists to receive the lessons from the luminaries of the musical culture, having invaluable experience and talent. Today, master courses have become an integral part of the educational process, creating additional opportunities for creative development. The MASTER COURSES TRIOMPHE DE L’ART are unique, because they bring together workshops of musicians from around the world in a single cycle for continuous professional exchange. Throughout the week, teachers will conduct classes and will share their secrets with the young musicians. 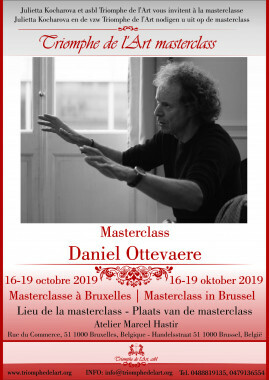 INTERNATIONAL VIOLIN MASTERCLASS TRIOMPHE DE L’ART on 28-29 September 2019. 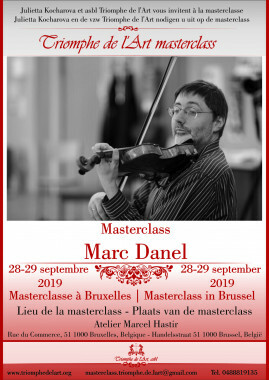 The masterclass is given by a famous violinist and violin teacher Marc Danel. 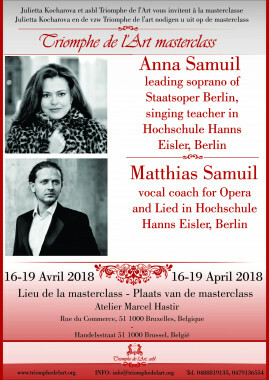 INTERNATIONAL VOCAL MASTERCLASS “TRIOMPHE DE L’ART” on 16-19 October 2019. The master course is given by an amazing vocal teacher Maestro Daniel Ottevaere. INTERNATIONAL VOCAL MASTERCLASS “TRIOMPHE DE L’ART” on 5-6 January 2019.
INTERNATIONAL VOCAL MASTERCLASS “TRIOMPHE DE L’ART” between 21 and 26 October 2018.
INTERNATIONAL INTENSIVE VOCAL MASTERCLASS “TRIOMPHE DE L’ART” on 5-6 January 2018. The intensive master course is given by an amazing vocal teacher Maestro Daniel Ottevaere. The number of places is limited! 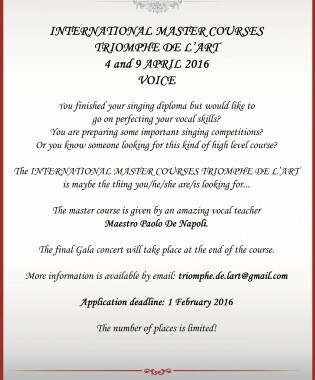 INTERNATIONAL VOCAL MASTERCLASS “TRIOMPHE DE L’ART” between 23 and 28 October 2017.
INTERNATIONAL VOCAL MASTERCLASS “TRIOMPHE DE L’ART” between 19 and 23 October 2016. 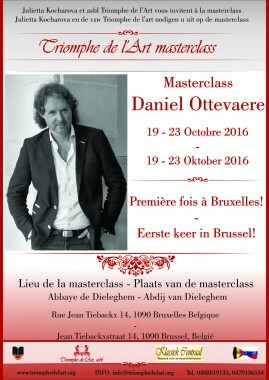 At the end of the masterclass (evening of 23 October 2016) there will be the final gala concert of the participants.